Sun-ripened Tomato & Basil Pasta Sauce. 1 of your 5 a day. No artificial colours, flavours or preservatives. No added sugar - contains naturally occurring sugars. Suitable for vegetarians. 1 portion = 1 of your 5 a day recommended intake of fruit and vegetables, as advised by nutritionists. The perfect partner for pasta! Simmer gently on the hob until the sauce is warmed through, then add to your favourite hot cooked pasta, stir through and enjoy. We recommend 100g of uncooked pasta per person. 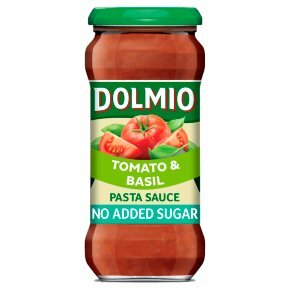 Simmer gently on the hob until the sauce is warmed through, then add to your favourite hot cooked pasta, stir through and enjoy.We recommend 100g of uncooked pasta per person.